Difficulty: Medium. Both RS and WS rows are charted. Patterned WS rows are very simple and consist of yo, k2tog, nupps, purl and knit stitches. Yarn: Garnstudio Drops Kid-silk or similar mohair/silk blend. In all 656 (763) 874 yards or 600 (700) 800 m. The small size uses all but a few grams, if you use larger needles than stated or have a slightly looser gauge, you may need an extra ball. Some brands of kidsilk have more yardage and are less fluffy than others. The bottom border takes about 1/3 of the yardage, or a little less than that. If you want to use two colours, you can change colour when you have finished the bottom border. Beads: Optional. When using beads, you will need 200 ( 230) 260 size 6/0 seed beads, or the size you think fits your yarn. Size: 3 sizes are suggested with 25 (28) 31 repeats of the edge, but it can be worked both smaller and larger than this. As shown with 25 repeats: 22 inches (56 cm) deep and 59 inches (150 cm) across. Needles: US 4 (3.5 mm) circular needle or the needle you need to get a fabric you like. Cable needle. Extra needle for the 3-needle bind off. Other notions: Stitch markers. Small crochet hook or other gizmo for placing beads (if using beads). Darning needle. 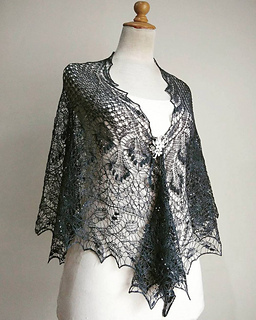 Construction: The shawl is worked from the bottom up. First the bottom border is worked in a long strip, then stitches are picked up in slipped stitches along the edge of the border and the rest of the shawl is worked with decreases. No short rows. The final stitches are bound off with a 3-needle bind off. The shawl has a nifty edge along the upper long side, which is part of the bottom border pattern. It also has a faux-faraose back, where the center stitches are decreased away to give a shawl which sits better over the shoulders.